Xen-Do is a skill for all ages! 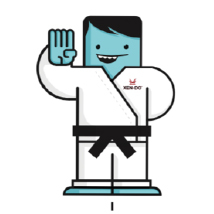 We encourage kids from as young as four years old to come and attend at our dojos. We think it is important for children to learn to defend themselves, have a hobby and find something they are passionate about. 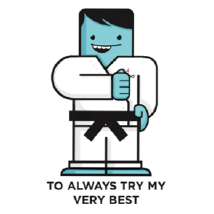 Our lesson plans include martial arts, stranger awareness and a behavioural grading system. Each child is given a homework sheet to keep up a positive attitude and reinforce good habits while outside of the dojo (i.e. in school, at home, etc). We love seeing the children’s faces when they achieve their belts! They train hard and do really well to learn their combinations with Sensei in their lessons. To all our future Junior or Little Champs here is our champions code to be ready for your first lesson! This is said all together at the beginning of your class. You will enter the dojo and line up with your fellow champs and recite this with your Sensei. The Champions code is a promise to remind ourselves the importance of how we should be behaving inside and out of the dojo. I – The champion’s code starts with the most important person. You! You are taking responsibility for your actions in and out of dojo. You have to know to do the right thing, be confident and know that every day you are the best version of you. You can always ask for help from your sensei, your parents or your teachers. They will give you advice and help how they can, but this is your code as a Little or Junior Champ! 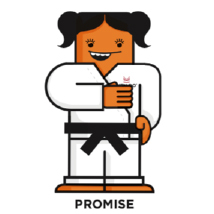 PROMISE – This is how Sensei will know that you have understood, you are willing to take part as a team and listen during class. It is a promise that you will help your classmates to climb the grading ladder with you. Most importantly, it is a promise to leave any expectation, limitation and judgement at the dojo floor! We want you to have fun! 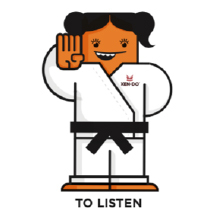 TO LISTEN – This is key inside and outside the dojo. It is something that should happen naturally. When someone is talking to you, you know from Listening Stance to look into their eyes. This shows that you are interested and engaging with the person you are speaking with. It is important to listen to teachers, parents and servicemen (policemen, firemen, paramedics etc). TO ALWAYS TRY MY VERY BEST – The key word here is ‘my’. It does not matter what belt your friends are or if you are finding something tricky. We want you to be yourself, give it your all and to make sure if you don’t understand you always ask for help. You will be a champion by just doing your best in everything you do. Remember it is not about the destination but the journey! If you try hard and give 100% you will already be a winner and have Xen-Do supporting, you the whole way! TO BE A GOOD FRIEND – We need to make this apply not just the people you call friends daily but to everyone (including animals). Being a good friend is about being kind and showing respect. It is about helping your fellow class mates or lending a hand to anyone that needs it. 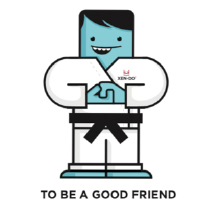 Being a good friend is being able to introduce yourself and make conversation with the other children in the dojo and at school to make sure that nobody feels left out. 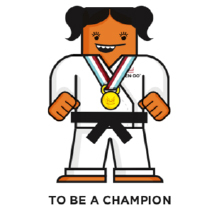 TO BE A CHAMPION – Getting your Black belt, although a great achievement and something to be very proud of, it is not what makes you a champion. It is not competition or fighting. It is applying everything in the champions code to every lesson and using it outside of the dojo, at home and in school. The key to be a champion is consistency. Show your Sensei you are listening, practice your combinations, make sure your homework sheet always has ticks and never any crosses. That will make you a Xen-Do Champion! !